Coverage for Bodily Injury to Others: At least $25,000 per person / $50,000 per accident. Coverage for Property Damage: At least $10,000 per accident. Uninsured Motorist Coverage: At least $25,000 per person / $50,000 per accident for bodily injuries. Many times, however, the bare minimum just isn't enough. After all, the legal minimum won't necessarily cover all the damage an accident can cause, including damage to your car, and it won't necessarily pay all your medical bills. Moreover, it won't cover expenses you might not have even considered, such as car rental fees while your vehicle is being repaired. That's why you should consider additional protection. Liability Coverage: This insures you for damages to the other party in an accident that is found to be your fault. While Wisconsin law requires minimum liability coverage, these limits can be easily exceeded, especially in a severe accident, or an accident involving more than two cars. It’s a good idea to look at higher limits to avoid finding that your policy limit has been exceeded and you are personally liable for high property-damage or medical bills. Collision Coverage: This type of coverage pays for the repairs to your car after an accident. Collision coverage is a prudent choice to get your car back on the road without having to pay high repair bills yourself. When considering collision coverage, the election of a deductible, or how much you have to pay before your insurance begins to pay, is an important consideration because even small changes in the deductible can affect the collision coverage premium. Medical Payments: Although not legally required in Wisconsin, this is a wise coverage-option for most drivers. Sometimes called “no-fault” insurance, Med Pay covers your medical expenses (or the expenses of anyone in your vehicle), regardless of who is at fault in an accident. Med Pay helps ensure that you receive the money you need quickly, without waiting for a determination of fault. Comprehensive Coverage: This coverage will pay for damage to your car caused by something unrelated to a collision. For example, if a storm causes a tree to fall on your car or your car is vandalized, comprehensive coverage could pay for the damage. Simply put, comprehensive coverage provides extra protection for your car, and extra peace of mind for you. Uninsured or Underinsured Motorist Coverage: Although Wisconsin car owners are legally required to carry auto insurance, unfortunately some don’t. Uninsured/Underinsured motorist coverage helps protect you when you are injured due to the fault of a driver without any insurance at all, or one who is carrying too little insurance. While state law requires that you carry uninsured motorist coverage, you may wish to consider increasing the limit so that you aren’t responsible for high medical bills after a severe accident with an uninsured driver. While those are just the basic types of coverage, you can also elect from a wide range of other Milwaukee auto insurance coverage options, including gap coverage, which pays the difference between what your car is worth and what you still owe on the vehicle. In addition, there are just as many ways to save on your Milwaukee car insurance premiums, including safe-driver discounts, good-student discounts, and more. One of the best ways to save on your Milwaukee auto insurance premiums is through an auto-home insurance package. Covering your cars and home with one carrier helps save with the premiums on each of your policies, as well as giving you the convenience of dealing with a single company. At the Insurance Center of Milwaukee, our vehicle-coverage options aren’t just restricted to your automobiles. We also have a range of insurance choices for motorcycles, RVs, boats, trucks. In short, if you can drive it, chances are good that we can insure it for you. At the Insurance Center of Milwaukee you can get an instant quote based on your car insurance needs before you ever speak to us. Just click the button at the top of the page to get an idea of how much you can save on your car insurance. You can also speak to us directly, where we will discuss your driving habits as well as the best coverage options for you. We’ll then help you get the best coverage available at the lowest possible rates from our many insurance carriers. Beyond helping you select the right policy however, we we’re here to help with all your insurance decisions. If you ever have a question about your coverage, just call us. We have years of experience, helping Milwaukee-area drivers like you, and you can trust us to give you sound advice. If your insurance needs change: for example, if your oldest child gets a learner’s permit, give us a call. If you have an accident or mishap, we’re here to help then, as well. At ICM, we’re here for you, through a lifetime of your Milwaukee car insurance needs. Call us today. 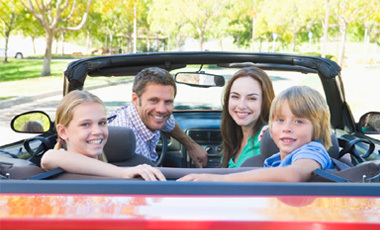 Auto insurance options featuring discounts for safe drivers and AARP members, among others. Auto-home insurance coverage packages that can save on both policies. Local, personalized service and advice that continues after you buy your policy. Coverage for vehicles ranging from cars and motorcycles to RVs and trucks.